This was a pre-Saunders Lakeland Mountain Marathon brush up/warm & general MM Skills Day. Perfect really for the 2 lovely ladies who attended the course. Both from Cheshire, Jill & Cheryl came with a mind to build on existing navigation skills to turn them into Mountain Marathon Skills. 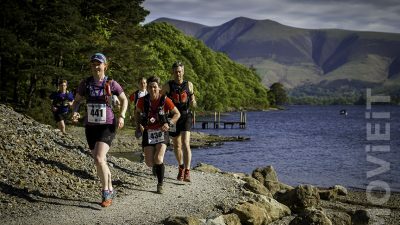 Luckily, Jill is taking part in next weeks SLMM & this year its being held over the Helvellyn Range, starting at Deepdale Hall at the foot of Deepdale. What a treat to be able to re-brush & develop your existing skills over the ground the your about to race the following weekend! We covered basic navigation skills, which are orientation of the map, reading the contours & features correctly & then setting a compass bearing. These are basic & simple skills, but take time to learn when you’re first shown. Without these basic skills, you will be all over the place, wondering where the hell you are. Master them & the world of navigation is your oyster! We then looked at “safe navigation techniques”, which consist of Handrails, Catchment Features, Aiming Off & Bouncing from feature to feature to break down a leg & make it more manageable. Handrails are as they sound, features we can literally use as a handrail, walking us along it to our destination. A handrail can be as simple as a path or stream/river, but wall, fences, ridgelines & contouring call all make excellent handrails in the right situation. Catchment Features do as they suggest, they catch you from going too far. Often your catchment feature will be prior to your control & help your mind switch on to the next leg before hitting the control. Sometimes the catchment feature will be after your control, stopping you before you make a big error. We looked at the merits of both uses. Aiming Off is a technique used to bring you close to your destination or next navigation change & will always work in conjunction with a catchment feature. You would use this to stop yourself missing the top of a stream, the end of a wall or a large tarn that you are using to catch yourself. Bouncing from feature to feature to break up a long leg will use a combination of the 3 techniques above, quite often using all three at the same time. All the above are essential Mountain Marathon Skills. We discussed Pacing & Timing & some of the equipment used by runners to help aid navigation, which are in keeping with the rules of Mountain Marathons, like roamer, altimeters etc. The course was run from Bell Cottage up underneath Greenside Mines & we were blessed with perfect weather, hot & sunny to start with a smattering of rain & an icy wind up at the ski hut on the side of Raise. We then descended to the foot of Kepple Cove & via a small tarn used as a control & made our way along the western flanks of Birkhouse Moor in glorious sunshine. 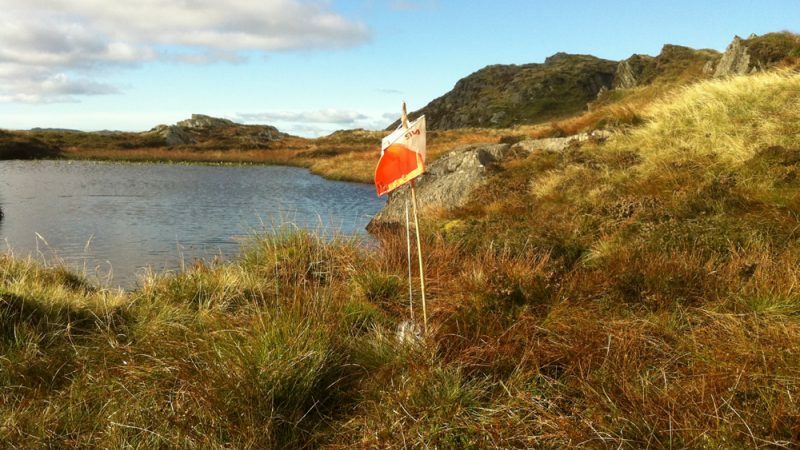 Various ground was covers, typical of Moutnain Marathon terrain, like hard pack tracks, small sheep trods, boggy & marsh ground, reed cover, steep fell sides, rocky ground & to finish a control at a crag foot, with braken thrashing to get to it, followed by a steep descent to a hard rocky & technical path.